Keystroke loggers, which secretly record key presses on a computer keyboard, are today’s criminals tool of choice for stealing passwords, credit card details and other secrets. However, keystroke loggers are not an invention of the internet age. In fact, it has been revealed that the world’s most successful electric typewriter was being bugged by the Russians using keystroke recorders as early as the mid 1970s. 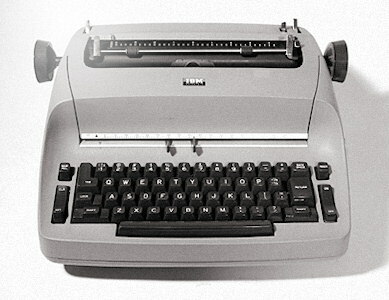 IBM’s “Selectric” typewriter had been invented in 1961 and 15 years later could be found in offices the world over. 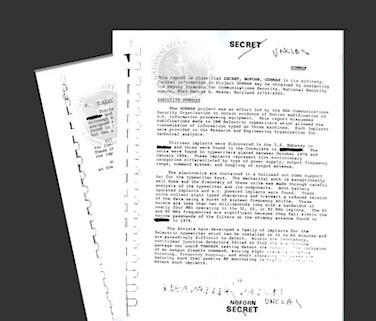 Declassified US documents released recently, reveal that the Soviets managed to produce keystroke loggers back in the 1970s and successfully installed them in at least thirteen Selectric machines at America’s Embassy and Consulate buildings in Moscow and St Petersburg. The spy devices were powered either by battery or directly from the mains supply which powered the electric typewriter itself. Once every 82 seconds the devices would transmit 400 microsecond radio bursts of eight encrypted keystrokes. In this way a record of what was being typed in the Embassy was passed directly to the Kremlin. The Soviets cleverly included a remote on/off switching facility to turn off the data bursts if they felt that security had been stepped up and there was a danger the Americans might detect the devices. Over a relatively short period five different versions of the Soviet Selectric datalogger were developed and covertly installed. The last of these was finally detected by the American Government TSCM teams in January 1984 and their discovery only added to the very high tensions between the superpowers at this time. It should be recalled that just 8 weeks previously, Soviet anti-aircraft facilities had misinterpreted ‘Able Archer’ (a NATO command post exercise) for an actual nuclear attack and gone to their highest alert status. This was the height of the cold war and is considered by many historians to be the closest the world came to nuclear war since the Cuban Missile Crisis.